The day started with people flowing in. I was working as a staff, welcoming and navigating them to the registration tables. After a while, the talks began. Unfortunately, I missed the first two of them (opening by James Long and Falcor by Paul Taylor). Argh, what a pity. The event continued with a short coffee break, during which attendees got to know the building and take part in some networking. The first talk after the break was about functional programming in JS by Daniel Steigerwald. 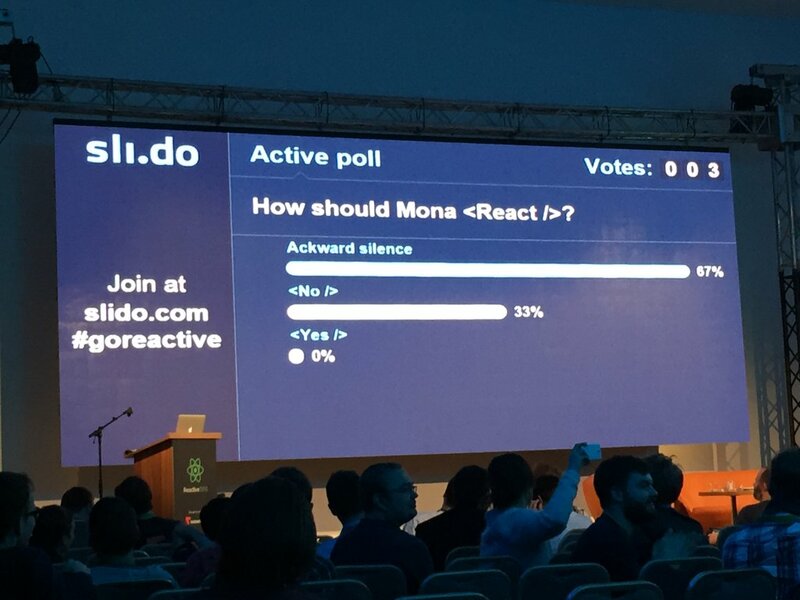 Although I liked his talk, I think his opinions of React and Redux winning over Angular were too strong. Nikita Prokopov, the man behind DataScript had his presentation right after. Ooh, it was too heavy on me, especially the Datalog query language. But I digress. What followed was one of the best talks. Have you heard about CSS Modules? That was it. A superb talk by Mark Dalgleish, who, in order to show us how awesome CSS Modules are, had to come a long way from Australia. It was definitely worth it, though. I need to learn more about them, moooar! Now the lunch break. Finally, we could stretch a bit. Being hungry, I and my friend went to a Chinese restaurant situated just outside the hotel to get some fresh food. Mhm, delicious. After the break, a long session of lectures took place. The first one was about a data visualization lib called Victory.js. With it, you can compose charts from simple React components. Nice! Christian Alfoni, a very cool guy, had a talk about his creation, Cerebral, which is “a project that separates storing state and producing state with a functional flow defining API called signals.” To be honest, I was beginning to be somewhat tired and didn’t pay much attention; I’m sorry. Fortunately, Julia Gao managed to wake me up enough to listen to her awesome talk on how to apply functional programming to front-end development, including Immutable.js. However, the one who completely woke me up to the point of laughing out loud, was Victor Grishchenko. 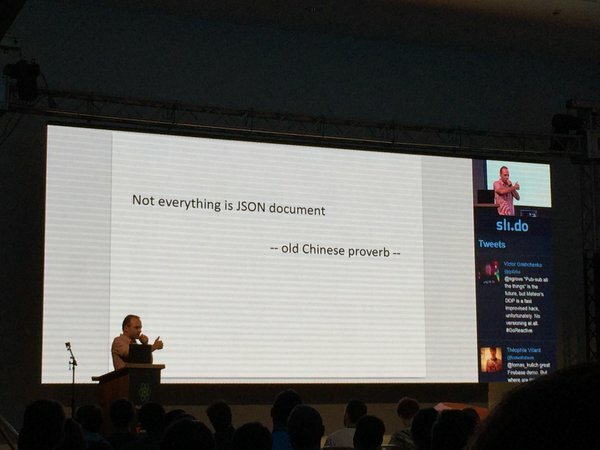 He lectured us about Swarm.js, but more importantly, he made us laugh, and I mean laugh a lot! Combining his strong Russian accent with the complexity of the topic and all the Pacmans on his slides made it one of the funniest talks of the day. In no way I want to offend him — on the contrary, I think it helped to loosen the tension and made the atmosphere friendlier. A real fun, indeed. I was lucky that Paul Taylor had another speech (as I missed his first one). It focused on RxJS and how they managed to boost its performance while reducing its memory usage. Enlightening, very much. Then came Rajiv Tirumalareddy, telling us something about building Universal (Isomorphic) React + Flux apps. Following a short coffee break, my favorite speaker, Tomas Kulich from Vacuumlabs (the company behind this event) showed us what is Firebase and how to build impressive web apps with it. It was nice and techy, and I could understand it. Now, the lightning talks! These were short 5-minute presentations on various topics. My favorite ones were: the Elm Stylesheets by Richard Feldman (awesome tech I need to learn, now) and the one about Relay and GraphQL by Ville Immonen. I’m still amazed that a 19-year-old-looking guy spoke about how he co-built a backend database to be used with GraphQL. Simply staggering! All in all, least but not last, it was a day well spent. I learned a bunch, met new people and got the word “functional” planted deeply into my brain. I’m not sure that I’ll sleep tonight. Still excited. But I have to — the second day is waiting! Enjoy the evening (and the night) and see you tomorrow. Oh, and I forgot to mention, to get some insightful links and statements, search through the “#GoReactive” hashtag on Twitter.